You (& Your Cat) Can BreatheFree for 30 Days: Litter Box Odor Control that Really Works! As cat parents, we’re always looking for the next-best-thing in controlling that cat box smell. 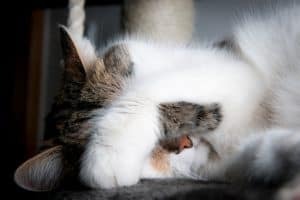 If you’ve ever bought litter additives that just don’t work, spent too much money on fancy litter that your cat won’t use, or used sprays that only temporarily mask odors instead of eliminating them – it’s time to try the BreatheFree Litter Box System. I share my home with 6 cats and there’s not much more embarrassing than having guests smell your cats before they actually see them! We’ve found the answer – the BreatheFree Litter Box System. Trust me, I was as skeptical as you are when I received a BreatheFree system to review. It’s not like any other litter box. What makes the BreatheFree system unique is that it uses a pad to absorb moisture and certain gases – like ammonia (the gas that gives cat urine it’s distinct stink!) 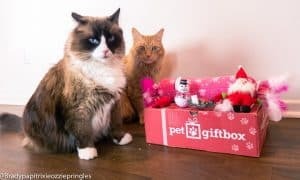 You see, even when you remove the clumps from your cat’s box, bacteria and odors are left behind, so there’s always going to be a tell-tale “cat box” smell. That is, until the BreatheFree system solved that problem! It completely eliminated the litter box odor in my home! In a small house with 6 cats – that’s a big deal. The BreatheFree system actually has two litter pans. You put a BreatheFree Litter Box Mate™ pad into the bottom pan first. Then, place the second grated pan into the first pan. Fill the grated pan with your cat’s favorite clumping litter. Scoop your cat’s litter normally, just as you would with any litter pan. The magic is in the pad below – it contains the mineral Zeolite and works for 30 days to absorb harmful (and odor causing) moisture and gases. After 30 days, you simply dump the used litter, remove the grated pan and the pad and start over with a new one! It’s easy to use, really works, and can save you money. No more fancy, expensive cat litter – just use any non-scented clumping litter. It’s also safer for your cat, since ammonia and bacteria that build up in litter boxes can cause upper respiratory problems for cats. What’s more, BreatheFree guarantees their product will eliminate cat box odors in your home for 30 days or they’ll give you your money back. Give the BreatheFree Litter Box System a try! Catington Post readers can get a 10% Discount by using the coupon code “CP” at checkout! 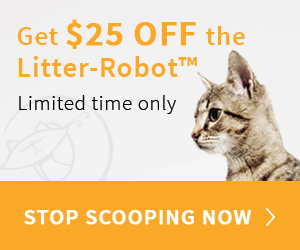 For the record, the system is already only $24.95 – that’s less than many plain old litter boxes on the market! You need to replace your litter box every year anyway. So, get a BreatheFree Litter Box – you (and your cat) won’t regret it. To order your BreatheFree Litter Box System, visit www.breathefreelitterboxmate.com. And then come back in 30 days and let us know what you think! Editors Note: This post is sponsored by BreatheFree, who provided a free litter box system for review. However, the opinions are 100% ours! We never recommend a product we haven’t tested and tried with our own cats. It’s the Purr-fect Gift that Keeps on Giving! Wow…..I use to use a hooded top box to control the odor. I know that is bad for the cats and for me when I opened to clean. No more hoods for me. This has no odor Nothing and its been 3 weeks now! Hasn’t anyone ever heard of plain old baking soda? I mean u can actually even drink this stuff if u have a tummyache. $1.09 vs $25.00…no brainer for me.